The catwalk stomp of Omaha fashion week is barely over, but textile creations of all manner still wrap around the Metro. Several galleries have focused on “material” culture, following the lead of the Kaneko, which has committed all of its exhibition spaces for three months to a half dozen shows featuring a range of historical and contemporary garments, tapestries and sculptures woven together under the rubric of Fiber. The undertaking is nothing if not impressive. The vocabulary of the textile arts is immense, usually savored among a smaller group of connoisseurs and crafters. Consider this random sampling of reasonably familiar terms: applique, beading, dyeing, embroidery, knitting, piecing, spinning, silkscreen, stitching, tatting, weaving, thread painting, warp and weft. With these techniques and more, artists and artisans can make items both functional and non-utilitarian in just about any set of forms, shapes and colors. Yet fiber arts remain cousins to the fine arts, appearing with only modest regularity on the same white walls that call attention to painting, sculpture, photography and printmaking. Intent, design, composition are factors in the production of all of the above; what varies most is the capabilities of each medium and the traditions from which each comes. One way to traverse this multiplicity at Kaneko would be to concentrate on the artistry in the sartorial arts, on those fashioners of garments and delightful designs featured in these three exhibitions: Kitsch to Art Modern: Meisen Kimono, the Hawaiian shirts of Florabunda: Designing on the Surface, and the works of Jon Eric Riis and Nick Cave in Fiber Legends. Meisen Kimono is a display of 22 Japanese robes from the early twentieth century that trace the expansion of a centuries-old couture tradition into ready-to-wear for the average citizen. As explained by guest curator Yoshiko Iwamoto Wada, the textile industry of the industrial revolution combined with access to the West resulted in a cultural shift. Silk kimono could be produced less inexpensively and more efficiently, and a once heirloom garment became accessible to folk of all means. By the early 20th century, Meisen (pronounced may-zen) were availale in a wide range of colors and designs. They were the fast fashion of their day, meant to worn and discarded within a few years. Popular until after World War II when western style clothing became the daily wear, Meisen are now a bit of a rarity and fun to see in such variety. At the time, there were strong cross-cultural currents with modern art and design in the west. Aspects of many movements can be seen in these robes: the sinuous florals of Art Nouveau, geometric patterning of Art Deco; the planar colors of Cubism; the linear abstraction of Atomic Age design. Shown in their purest form—without the obi sash that would have defined a waist and kept the garment closed—the strong vertical graphics shine. Perhaps a function of the curatorial eye that selected these items, their designs all feel retro-fresh and new. Moving into the mid century are the exuberant designs of Hawaiian shirts featured in Florabunda. The 100+ shirts on display here dance festively above your head, suspended in circles from an ingeniously devised copper clothesline. Assembled from an anonymous private collection, these shirts display the abundance of floral and pictorial designs that characterized the classic period of the Aloha shirt in the 1940s-‘70s. These bright silkscreened men’s shirts with their ornate designs quickly became the epitome of tropical wear. They took off in the post-World War II era when many servicemen came home from their Pacific tours with these wild prints. Jet travel also increased tourism to Hawaii and they became a souvenir of choice. Eventually, they became local office wear—did you know Hawaii pioneered the concept of Casual Friday with the introduction of Aloha Fridays in the 1960s? The exhibition singles out the work of several graphic artists who kept the industry vibrant. Aflred Shaheen, John Meigs, Elsie Das and Vera Stone Cook all found in the tropics an endless supply of beautiful inspiration, especially in its lush plant life. The Hawaiian shirt, usually short sleeved, with back yoke, pointed collar and a pocket or two, was a template relatively unchanged by time, yet proved a remarkable blank canvas for border and all-over patterns. There’s so much to look at in Florabunda that it seems irrelevant to over-analyze the development of any individual graphic design. It’s a show that brings a smile, perhaps a wave of nostalgia, and the decided hankering for a tropical vacation or a fruity drink. It presents the ultimate in modern male peacockery; their loud, splashy colors and patterns–giant flowers, palm trees and surf scenes–sproviding a kind of ornamental splendor not seen frequently in most other casual or daily contexts. The suitings of Cave and Riis, by contrast, take clothing beyond function to the realms of costume, ceremony and pure art. The Chicago based Cave is known for his Soundsuits, which are elaborate rainments assembled from a variety of rescued materials, including old textiles, crocheted afghans, patterned tights, embroideries, artificial flowers, and buttons by the barrel full. Shown in exhibition over manequins, they are usually designed to be worn in gallery and street dance performances where their melange of items rattle, clatter and swish, creating a spectacle of both sight and sound. There is something of utter wonder in Cave’s art. Ordinary materials are transformed into costumes that define fantastic creatures. One untitled armor-like suit, composed of shell and bone buttons in subdued range of metallic, is topped by an oval basket head filled with copper wire; the net effect is one of an alien being from an unknown galaxy. Another whose pieced suit is a patcork of leopard skin print with sewn embellishments is surmounted with a tiered metal armature to which are affixed artificial flowers in metal. This chandelier/cage makes the figure into a lifesize rattle toy. As costumery, Cave’s Soundsuits are reminiscent of ceremonial vestments–something in whose every stitch, color and shape some great, long held beliefs are attached. They are reminiscent of any number of serious cultural drag, from the high church to Native American kachinas, Mardi Gras Indians, African ceremonial masks and costumes, all the way to the Miss Universe pageant. They embody power and spectacle, while at the same time confounding any readings according to race, gender and ethnicity, not usually in clothing’s power to disguise. Then each embellished human form invites you to look closely, unraveling the familiar source materials that have been transformed into these larger and more intricate wholes. The unity he creates from discarded and disparate elements breathes new life into tired objects. By contrast, Atlanta based artist Riis utilizes his vast knowledge of ancient Asian textiles to construct new garments with antique references. A tapestry artist who specializes in intricate pictorial designs, Riis frequently plays with social and cultural ideas. His Tapestry Skull Coat is such an example. Using a coat form he calls “universal”, he has sewn pearl beads in concentric circle patterns over the entire exterior, which is delicate and beautiful in itself. Array within many circles are medallions woven in metallic threads with smiling skull motifs rendered in neon brights. 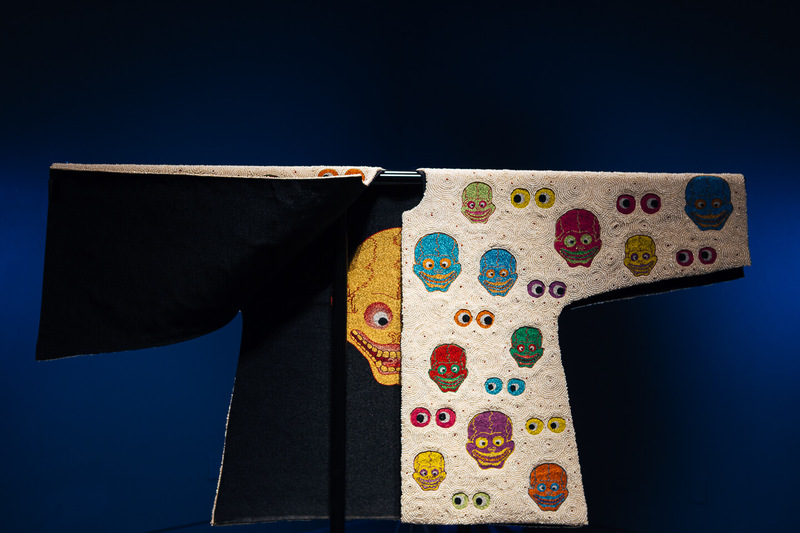 A single large skull is also woven into the coat lining. Study reveals these motifs related to Tantric Buddhism, where they are regarded as symbols of the destruction of the individual ego, which opens up a person to the possibility of spiritual rebirth. To the non specialist, they also call to mind Mexican Day of the Dead figures, Lucha Libre wrestler’s masks, and anime characters. No matter, the resulting garment is splendid, fun and a little macabre. Most intentionally humorous is Riis’ Congressional Constraint Tapestry, a red woven straitjacket with the elephant and donkey symbols of our main political parties. Made in 2012, it’s a most pointed reference to our so-called “do thing Congress” that has constrained itself (and the country along with it) by its continual mode of opposition. It extends our appreciation for the depth of Riis’ practice to know that he derived the form of the coat from an ancient Peruvian chimu textile, but, really, what is more delightful than the fact that the jacket’s pendant fringes are boxing gloves in red and blue. It’s a real knockout! Fiber continues until April 25, 2015 at Kaneko, 1111 Jones St. For details, go to thekaneko.org.